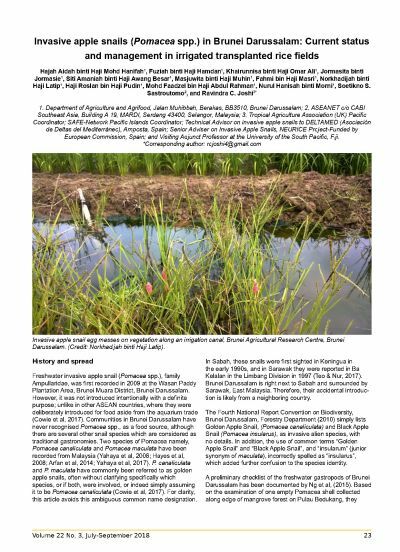 This short research note provides insights on the invasive apple snails (Pomacea spp.) and rice cultivation in Brunei Darussalam. This freshwater invasive snail was first detected in 2009, but it was never introduced intentionally. Since then their population has increased swiftly and spread to almost all the rice areas across the country, becoming a major pest of irrigated transplanted rice. To reduce their crop damage in Brunei Darussalam, synthetic molluscicides are commonly used. 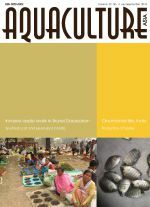 Research and collaboration among infested countries, particularly with ASEAN countries, is important for accurate species identification and better understanding of the invasion pathways, so as to prevent its further spread and to develop integrated management options against invasive apple snail infestations.